I've never had a particularly strong connection to meat. That's not because I don't like the stuff. In fact, it's just the opposite. I love it. But I've always been one to save my meat-moments for those times I knew I'd be getting a quality product. 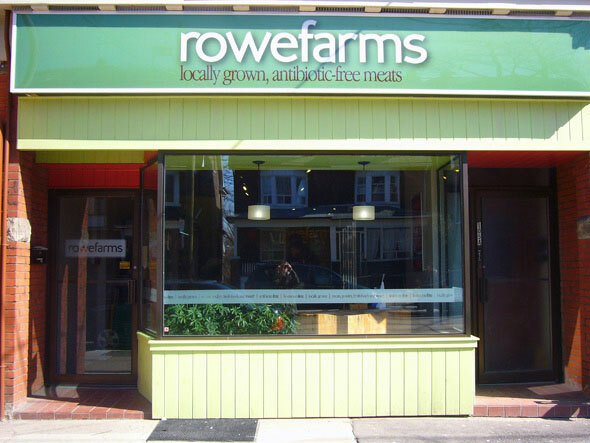 Which is why I was so excited to discover a new outpost of Rowe Farms on Ronces . Everything in the store (and I do mean everything!) 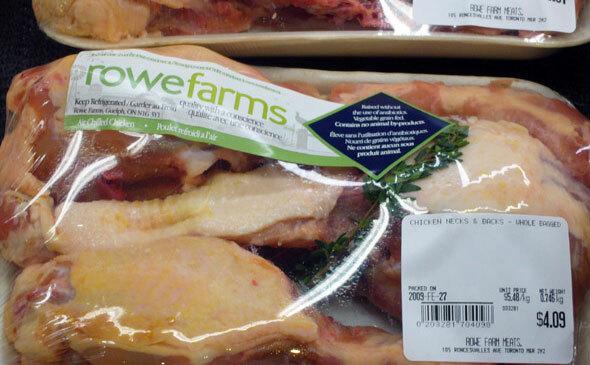 is locally grown, with a focus on organic, pesticide and antibiotic-free meats. The goal is to provide "quality foods with a conscience" and to bring people closer to what they eat. And it works. Their checkout counter is a map of suppliers the store uses (from Campbellford to Collingwood, and Peterborough to Guelph). And the friendly staff (on this particular day Matt and Jason) is happy to educate me on the different cuts of meat, where they come from and how to prepare them (especially important if you don't know your way around the kitchen... like me). My first stop is the packed row of freezers on the right side of the store. I'm blinded (in a very, very good way) by all the carnivorous delights: wheat free Italian sausages ($5.09/lb), nitrate free beef wieners ($5.09/lb), extra lean ground beef ($6.29/lb) and chicken wings ($7.99/kg). I move to a nearby refrigerator and discover an impressive selection of pre-packaged marinated cuts like herb flattened chicken ($6.29/lb) and hoisin pork chops ($11.39/lb). There's even a small selection of every day items like nitrate-free eggs, kielbasa sausage, boneless ham and organic milk. 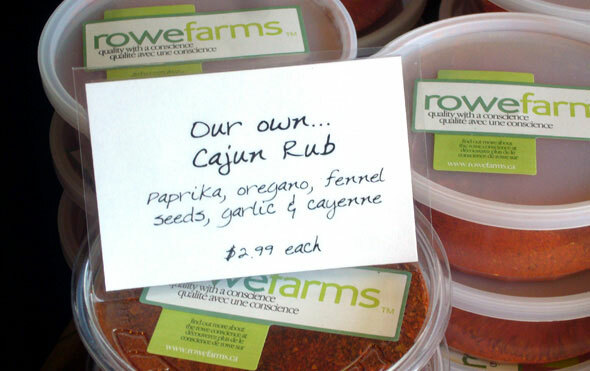 A nearby vintage-looking butcher block displays some of the store's homemade marinades and rubs. It all starts to make me a little hungry. So I head to the back and check out their meat counter. It's time for me to decide on dinner. There's the prime rib roast (one of the most amazing cuts of meat I've ever seen). And the Ronci broil (a popular choice, I'm told). 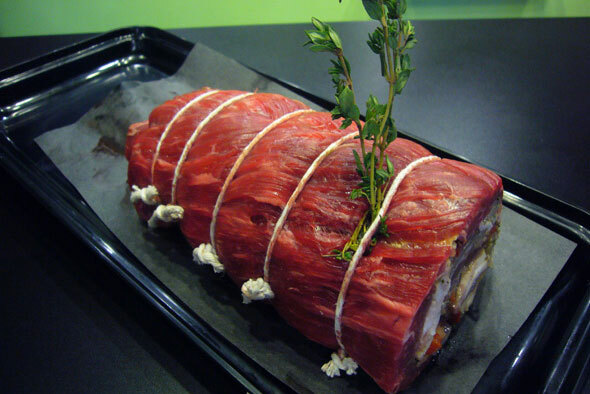 And the apple pine nut pork loin (stuffed with sweet apples, bacon, onion and pine nuts, it's something I'd envision myself eating at the Last Supper). 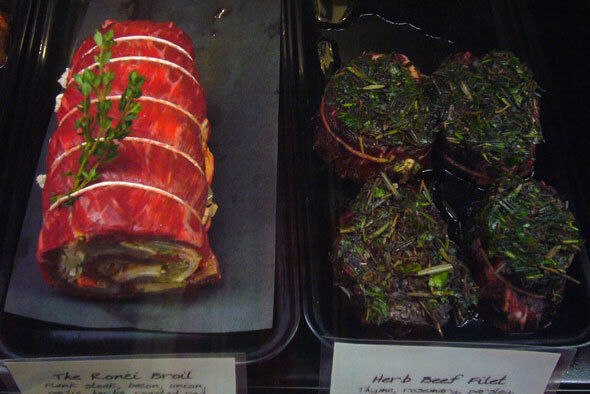 In the end, I settle on two beef herb fillets (tightly wrapped, they're topped with an irresistible mix of thyme, rosemary, parsley, garlic and canola oil). I celebrate my choice with a few bites of organically made shortbread ($5.79) and proclaim, to anyone who's listening (which is about 12 other customers walking through the store's constantly revolving door), "I love this place."